Is your lawn consuming too much time and effort? The combination of control, comfort and efficiency will not only make your work easier – you’ll also enjoy the ride. 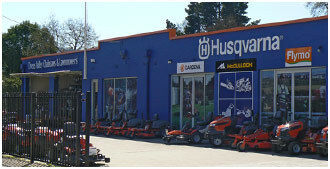 The Rider Battery is Husqvarna’s first battery-powered ride-on mower. With no emissions, low noise and up to 90 minutes runtime, depending on lawn conditions, it?s the perfect choice for residential gardens – you get the comfort and performance of a Husqvarna Rider, without disturbing your neighbours. Powerful and versatile Rider with twin-cylinder engine and 103cm Combi cutting deck, offering first-class BioClip© and rear ejection cutting. Suitable for landowners who demand superior efficiency, manoeuvrability and perfect results all year round. The articulated steering system and front-mounted cutting deck enables intuitive operation, excellent mowing accessibility and great overview of your working area. In short ? this Rider gives you the ultimate driving experience. Can easily be fitted with a number of attachments such as a broom for maximum output throughout the year. Features like pedal-operated hydrostatic transmission, easy-access controls, headlights and cutting deck service position, makes operating and servicing this Rider a pleasure. Powerful and versatile Rider with twin-cylinder engine and All-Wheel-Drive. Optional 94, 103 or 112 cm Combi cutting decks, offering first-class BioClip© and rear ejection cutting. Suitable for landowners who demand superior efficiency, manoeuvrability and perfect results all year round. The articulated steering system and front-mounted cutting deck enables intuitive operation, excellent mowing accessibility and great overview of your working area. All-Wheel-Drive remarkably increases and secures handling on uneven, wet and slippery areas as well as on slopes. In short ? this Rider gives you the ultimate driving experience. Can easily be fitted with a number of attachments such as broom, flail mower, snow blade and snow thrower, for maximum output throughout the year. Features like power steering, pedal-operated hydrostatic transmission, headlights and cutting deck service position, makes operating and servicing this Rider a pleasure.